Air Jordan’s new business plan for 2018 is paying off enormously. While the return of many OG colorways has been well received, the addition of actually exciting new colorways is the best part, like this “Chlorophyll” Air Jordan 3 launching this Fall. The Air Jordan 2018 Release Lineup has already proven itself to be one of the best in recent memory. With the return of legendary sneakers like the Jordan 3 in both “Cement” colorways or “Shadow” Jordan 1, Jordan Brand has shown that they’re not playing around. This week, we have an early look at a potential new Air Jordan 3 colorway rumored to release sometime this Fall. Inspired by the legendary “Chlorophyll” colorway made famous by shoes like the Patta Air Max 1 and Air Trainer 1, this new Jordan 3 is sure to go down as one of the best this year. Beginning with a smooth grey suede upper, the silhouette is framed by black elephant print along the heel and toebox. White or silver appears to take over most of the detailing, while the signature chlorophyll green is added to the eyelets, inner lining, and hangtag for a minimal but essential touch. The Air Jordan 3 was recently leaked in an exciting new “Chlorophyll” colorway, which is rumored to release on October 13th, 2018. Because this is a placeholder date, the release is likely to be pushed back by a month or two. Check out the early in-hand teaser from zSneakerheadz below, and stay tuned to JustFreshKicks for more Jordan release news. 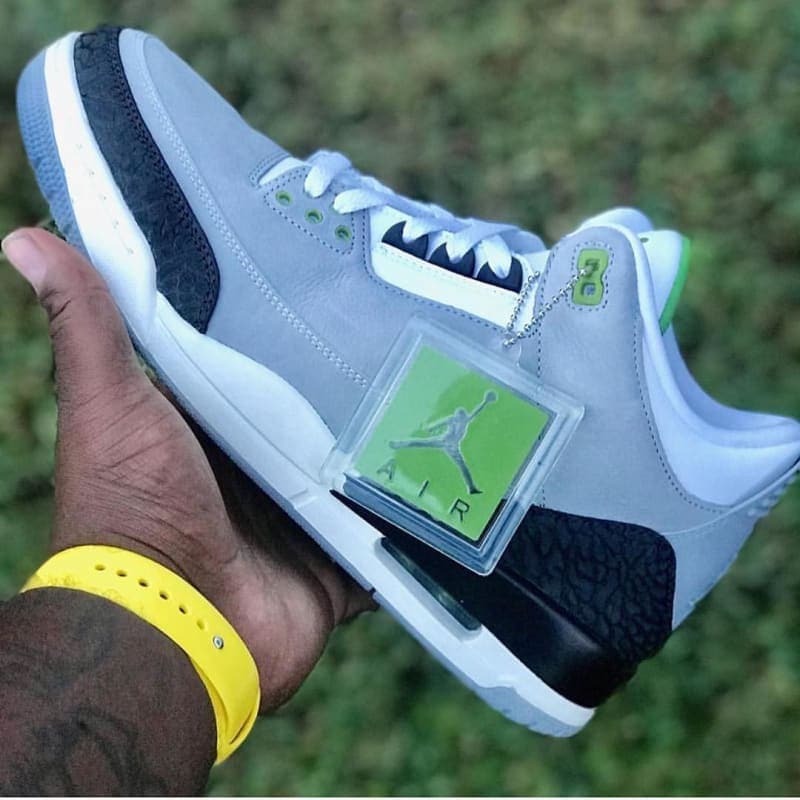 The post The Air Jordan 3 Surfaces in a Minimal “Chlorophyll” Colorway appeared first on JustFreshKicks.